Your dog may need help to walk if his hind legs are very weak or paralysed, e.g. if he’s recovering from IVDD (intervertebral disc disease). Some of these dogs cannot move their hind legs at all. Others are able to move their hind legs a little but cannot yet take proper steps. Why use a hindquarter sling? Without any help, these dogs either fall or drag their hind legs along the ground when trying to walk. 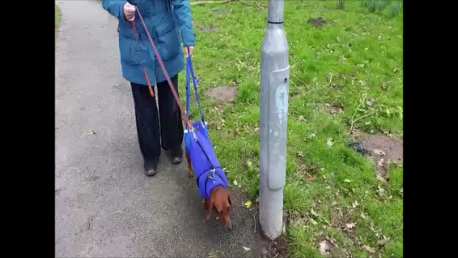 It’s not a good idea to let your dog drag himself along. Firstly, dragging can damage the skin where it scrapes along the ground. Secondly, your dog will find it very hard to walk properly again once he’s got into the habit of dragging himself along. A good way to learn to walk is to be given some physical support while “having a go” at walking. The aims of sling-walking are to keep the dog safe as he attempts to walk, and to help him to learn to walk. Take your recovering dog out for toileting (to pee and poo) for up to five minutes at a time at least three times daily. Ask your dog’s vet to advise you on how many times to take him out per day. If your dog can’t walk (if he just drags himself or keeps placing his paws upside-down) then do help him with a hindquarter sling whenever he’s on the ground. 1) A “scarf-style” sling. This is a long piece of fabric that loops under the dog’s belly, and is the commonest type used for dachshunds and other small dogs. 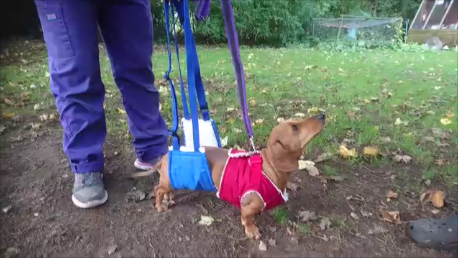 These slings are available with adjustable straps for the owner to hold above the dog. You can get a similar effect by using a long woollen scarf or a horses’s polo wrap. A scarf is a nice simple solution. However, some people (myself included) prefer a purpose-made sling to a scarf because its strappy handles offer more precise control. This type of sling should be soft and not too narrow, otherwise it will dig into your dog’s belly. For boy dogs, it should also not be too wide, otherwise your dog won’t have room to pee. For boy dogs, the width of the sling should be a little less then the distance between the front of his thigh and the front of his prepuce. If the sling or scarf is too wide, then you may need to fold it back onto itself at the front to leave space for your boy dog to pee. 2) A “pants-style” sling. This sling has two holes, one for each hind leg. It offers support around the hind legs where it’s needed. These slings have strappy handles. Choose a sling that fits snuggly enough to give support but that doesn’t pinch or chafe your dog’s skin. It should leave room for your dog to pee and poo. The handles should adjust so that you can support your dog without stooping. You may need to search around to find the sling that best fits your dog. 3)For large breeds and tall dogs, a “rear-end harness” that supports the hindquarters is a good investment. I can recommend the help ’em up harness which has a handle for the owner to hold just over the dog’s rump. This system offers good support for safety and comes together with a useful chest harness. Instead of having long straps, the handles of the help ’em up harness are short and strong, like suitcase handles. This gives great control but makes this system less useful for small dogs such as dachshunds. While walking on a hindquarter sling, your dog should be kept on the lead. This is important. Not only does the lead stop your dog from rushing off, but it also helps to slow his front end down so that he can learn to step with his hind legs. It’s far better to attach the lead to a good chest harness than to a collar. 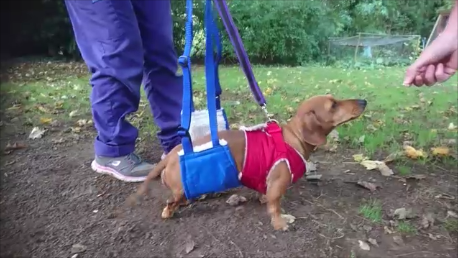 This is firstly because the lead attachment on a harness is further back then it is on a collar, thus helping to spread your dog’s weight more evenly as he learns to walk again. Secondly, the neck is a delicate area, and it’s therefore best not to attach the lead here, especially while the dog is relearning how to walk and may lose his balance now and again. Above: Frankie the miniature dachshund could stand but had not yet taken any steps with her hind legs. She was reluctant to move at all with the sling on to start with, but she was keen to investigate the chicken shed, and this gave her some incentive to learn to walk. The lead was essential in stopping Frankie from disappearing under the chicken shed! First put your dog’s harness on and attach the lead. 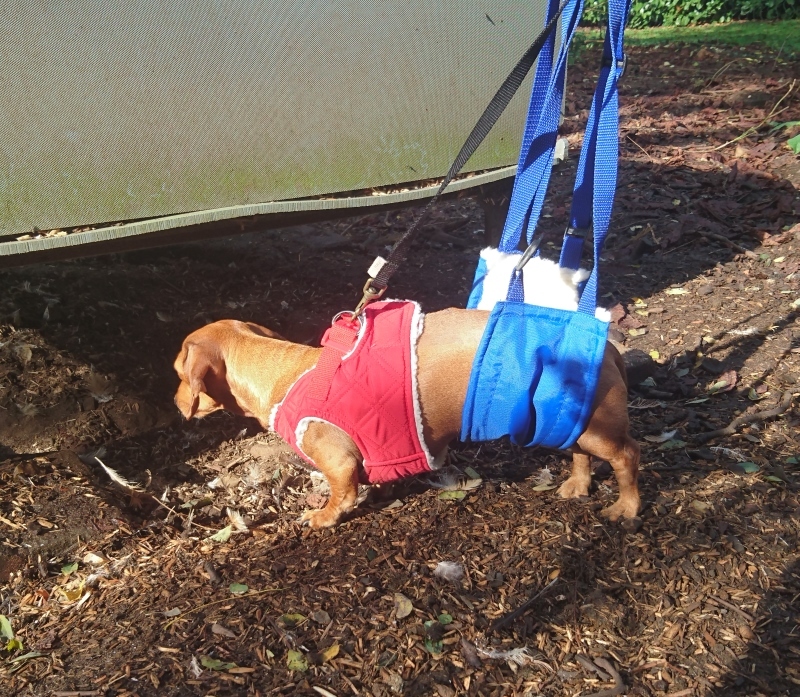 If using a pants-style sling or rear-end harness then put that onto your dog at this stage and adjust the straps. If using a scarf-style sling then just take this with you. Carry your dog outside to a suitable walking spot. Short grass, concrete or dry earth are all ideal. Put your dog onto the ground. If using a scarf-style sling then loop this under your dog’s belly as far back as it’ll go without interfering with his hind legs. Hold your dog’s lead with one hand and the straps of the sling with your other hand. Use the sling to support your dog’s hindquarters so that they don’t drag on the ground. Don’t lift your dog’s rear end too high though. His back should not be angled steeply upwards or he won’t have the chance to try and step. Most dogs try to rush forward a bit too fast. Use your dog’s lead as a “brake” to slow him down to a slow walking pace. This will give him the chance to try and use his hind legs. Above: This dog is learning to walk again after spinal surgery. We let her hind paws go as low as this just now and again to give her a chance to walk. We don’t want the paws continuously dragging on the ground as this could damage them. Above: Sometimes we lift the dog’s rear end a little higher, to prevent the paws from dragging on the ground. Above: This dog’s hindquarters are lifted too high off the ground. His sling also tended to position the hind legs out behind him. Unfortunately, lovely Harry didn’t use his hind legs again after learning the skill of walking on his front legs. When you place your dog onto the ground for sling-walking, crouch down and position him in as neat a standing position as possible. Putting your dog in a standing position sets him up for success by giving him a better chance of pushing off with a good walking step. Aim to have all four paws the correct way up on the ground. There should be a leg “at each corner of the dog”, i.e. he shouldn’t be positioned with his legs crossed. If you need to correct the position of a paw, then prevent him from toppling by supporting him with your free hand under his belly while you do this. NB you may find that you don’t seem to have enough hands for this job: bunch the lead and/or sling straps into your hand while you adjust your dog’s position, or get a friend to help you. 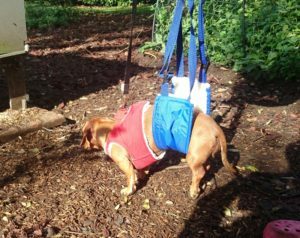 If your dog is making early attempts to step with his hind legs, then you may be able to use the sling to help him step. Dogs recovering from IVDD tend to move the top of their legs back and forth, yet not quite manage to lift their paws clear of the ground or place the paws flat. Try lifting and lowering the right and left sides of the sling in time with his attempted steps. A slight lift to the left side of the sling will help the left hind paw come up off the ground. Lowering the left side of the sling will help that paw to come down onto the ground. Don’t worry if you don’t manage this: it only works if the dog is attempting to step a little, and is quite a fiddly technique. For best effect, you’ll need to arrange the right and left strap-loops of the hindquarter sling so that you can control them separately. It’s possible to control them using different fingers of one hand, but is very fiddly. In addition to the above, do use your dog’s lead to keep him slow. This means holding his lead in your other hand so that you can slow him down and give him a chance to step properly. Should I get a lead that is attached to a hindquarter sling? It’s not a good idea to have the lead attached to the sling. This system is available as a “ginger lead”, which at first glance looks very convenient. The problem is that the lead and sling do two different jobs and must therefore be controlled separately. The lead slows the dog down. The sling supports the rear end. If sling-walking your dog correctly, you should find yourself moving the lead and sling handles in different directions to one another. If your dog is just a bit wobbly and he’s not too low to the ground, then you may simply be able to use one of your hands to stop his rear end from tipping over or collapsing. This is a tricky technique that is not possible for every dog. Try using a hand to give support on and off, just when needed. A good place to position your hand for this is typically against the weaker side of the dog’s rear end (pelvis). You’ll need to have the dog on a harness and lead: use the lead to slow him down to make it easier for your dog to step with his hind legs. It’s best not to support your weak dog by his tail as he tries to walk. “Tail-walking” can be painful for the dog, and it is likely to cause longer term damage to the rear end of the spine and/or to the delicate nerve roots. 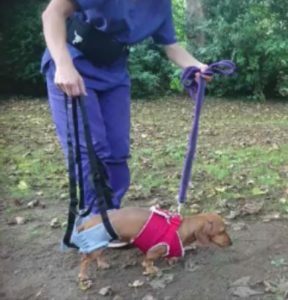 I’m looking for a sling for a male dacshound that weights 21lb that has just had IVDD surgery but is still paralysed at the time of this email with no feeling to his hignd legs. The Catac rear support sling works okay for a male dog. Sizing depends on thigh circumference. I suggest look at their website and contact them if sizing is unclear.